President Donald Trump invited families at an event on Friday to share stories of their loved ones allegedly killed by unauthorized immigrants. These families, Trump said, were "permanently separated." His administration has been under fire for weeks over its recently halted practice of splitting up migrant families at the border.Trump autographed posters of the victims' faces. 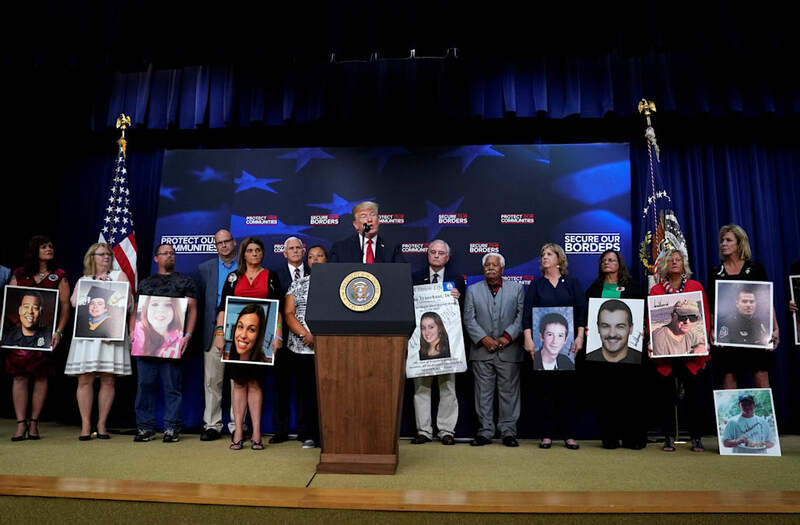 President Donald Trump spoke Friday at an event with families he said had been "permanently separated" from loved ones who were allegedly killed at the hands of unauthorized immigrants. His remarks came in the wake of nationwide outrage over the Trump administration's recently halted practice of separating migrant families at the border. More than 2,300 children were split from their parents since May, and stories of traumatized children and desperate parents have been highlighted by the national media for weeks. But one by one, Trump brought up family members to speak at a podium before an audience of law-enforcement officers. Each family member held large posters of their loved ones' faces, which Trump had autographed. Trump accused the media of ignoring the families of victims killed by unauthorized immigrants, and instead focusing on the migrant families who had in many cases illegally crossed the US-Mexico border to seek asylum. "You hear the other side, but you never hear this side. You don't know what's going on," Trump said. "These are the stories that Democrats and people that are weak on immigration, they don't want to discuss, they don't want to hear, they don't want to see, they don't want to talk about." Hermilo Moralez, who was 19 at the time of the murder, is a Belize national who was living in the US illegally. He is now serving a life sentence in prison after admitting to the killing, according to The Houston Chronicle. Trump has frequently used parents such as Laura Wilkerson to bolster his arguments for a border wall and against so-called "sanctuary cities," where law-enforcement agencies limit their cooperation with immigration authorities. But on Thursday, Trump appeared to draw a connection between the families he brought on stage, and those his administration forcibly separated, which he implied were temporary. "These are the American citizens permanently separated from their loved ones, the word 'permanently' being the word that you have to think about," Trump said. "They're not separated for a day or two days; they're permanently separated because they were killed by criminal illegal aliens." Though Trump has said he intends to reunite the separated migrant families, lawyers and experts have pointed out that reunification may be impossible for some. Children who were transferred into government custody were flown to shelters and foster-care families across the country, while some parents were deported back to their home countries alone. Meanwhile, the government agencies in charge of the families have not clarified a system for reunification, and the process has been bogged down with chaos and red tape. But many of the parents at Friday's event, including Wilkerson, echoed Trump's remarks, suggesting that the migrant families would be reunited within days. "None of our kids had a minute to say goodbye — we weren't lucky enough to be separated for five days or 10 days. We're separated permanently," she said. "Anytime we want to see or be close to our kids, we go to the cemetery because that's where they are."